John Henning Senior was raised in Scotland, and after training under his father as a builder, turned to wax portraiture, and then, in 1803 after coming to London where he saw the Elgin Marbles, he turned to sculpture. Over more than a decade he carved a copy of the frieze, with his own additions to fill in the missing portions, and sold copies of this in plaster at reduced size. He also continued to produce wax portraits, and some small portraits for reproduction in Wedgwood, and later on, made copies in plaster after the Raphael Cartoons at South Kensington, which were much admired. Henning exhibited at the Royal Academy in the 1820s, and at varying periods at the British Institution, and the Royal Scottish Academy. He was a founder member of the Society of British Artists. 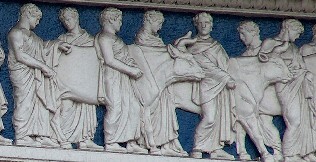 His chief work to be seen is the frieze around the Athenaeum (1830) in Waterloo Place, London. This is based on his version of the Parthenon frieze. Although Henning Sr's Elgin marbles reductions were popular, they were increasingly pirated, and in the end this led to Henning's financial ruin. John Henning Junior, eldest son of the above, also worked in relief sculpture. Alas, some of his work, including a frieze for the Colosseum in Regent's Park, has perished. 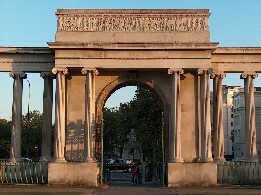 However, still extant is his important relief for Decimus Burton's Hyde Park Corner Screen (see the Hyde Park Corner page), and reliefs on the front of the museum in Manchester, and a massive monument to the Duke of Leicester at Holkham Hall. He also made various busts and a few full statues, some of which were exhibited at the Royal Academy, from 1828-1852.